A pyramid scheme is a business model that recruits members via a promise of payments or services for enrolling others into the scheme, rather than supplying investments or sale of products. As recruiting multiplies, recruiting becomes quickly impossible, and most members are unable to profit; as such, pyramid schemes are unsustainable and often illegal. Pyramid schemes have existed for at least a century in different guises. Some multi-level marketing plans have been classified as pyramid schemes. In a pyramid scheme, an organization compels individuals who wish to join to make a payment. In exchange, the organization promises its new members a share of the money taken from every additional member that they recruit. The directors of the organization (those at the top of the pyramid) also receive a share of these payments. For the directors, the scheme is potentially lucrative—whether or not they do any work, the organization's membership has a strong incentive to continue recruiting and funneling money to the top of the pyramid. People in the upper layers of the pyramid typically profit, while those in the lower layers typically lose money. Since most of the members in the scheme are at the bottom, most participants will not make any money. In particular, when the scheme collapses, most members will be in the bottom layers and thus will not have any opportunity to profit from the scheme; still, they will have already paid to join. Therefore, a pyramid scheme is characterized by a few people (including the creators of the scheme) making large amounts of money, while subsequent members lose money. For this reason, they are considered scams. The "eight-ball" model contains a total of fifteen members. Note that in an arithmetic progression 1 + 2 + 3 + 4 + 5 = 15. The pyramid scheme in the picture in contrast is a geometric progression 1 + 2 + 4 + 8 = 15. Many pyramids are more sophisticated than the simple model. These recognize that recruiting a large number of others into a scheme can be difficult, so a seemingly simpler model is used. In this model each person must recruit two others, but the ease of achieving this is offset because the depth required to recoup any money also increases. The scheme requires a person to recruit two others, who must each recruit two others, and so on. Prior instances of this scheme have been called the "Airplane Game" and the four tiers labelled as "captain", "co-pilot", "crew", and "passenger" to denote a person's level. Another instance was called the "Original Dinner Party" which labeled the tiers as "dessert", "main course", "side salad", and "appetizer". A person on the "dessert" course is the one at the top of the tree. Another variant, "Treasure Traders", variously used gemology terms such as "polishers", "stone cutters", etc. Such schemes may try to downplay their pyramid nature by referring to themselves as "gifting circles" with money being "gifted". Popular schemes such as "Women Empowering Women" do exactly this. Whichever euphemism is used, there are 15 total people in four tiers (1 + 2 + 4 + 8) in the scheme—with the Airplane Game as the example, the person at the top of this tree is the "captain", the two below are "co-pilots", the four below are "crew", and the bottom eight joiners are the "passengers". At ten levels deep, the "airplane game" has an 87% loss rate. The eight passengers must each pay (or "gift") a sum (e.g., $5,000) to join the scheme. This sum (e.g., $40,000) goes to the captain, who leaves, with everyone remaining moving up one tier. There are now two new captains so the group splits in two with each group requiring eight new passengers. A person who joins the scheme as a passenger will not see a return until they advance through the crew and co-pilot tiers and exit the scheme as a captain. 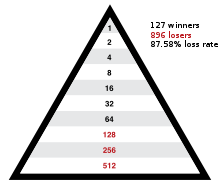 Therefore, the participants in the bottom three tiers of the pyramid lose their money if the scheme collapses. If a person is using this model as a scam, the confidence trickster would take the majority of the money. They would do this by filling in the first three tiers (with one, two, and four people) with phony names, ensuring they get the first seven payouts, at eight times the buy-in sum, without paying a single penny themselves. So if the buy-in were $5,000, they would receive $40,000, paid for by the first eight investors. They would continue to buy in underneath the real investors, and promote and prolong the scheme for as long as possible to allow them to skim even more from it before it collapses. Although the "captain" is the person at the top of the tree, having received the payment from the eight paying passengers, once they leave the scheme they are able to re-enter the pyramid as a "passenger" and hopefully recruit enough to reach captain again, thereby earning a second payout. Matrix schemes use the same fraudulent, unsustainable system as a pyramid; here, the participants pay to join a waiting list for a desirable product, which only a fraction of them can ever receive. Since matrix schemes follow the same laws of geometric progression as pyramids, they are subsequently as doomed to collapse. Such schemes operate as a queue, where the person at head of the queue receives an item such as a television, games console, digital camcorder, etc. when a certain number of new people join the end of the queue. For example, ten joiners may be required for the person at the front to receive their item and leave the queue. Each joiner is required to buy an expensive but potentially worthless item, such as an e-book, for their position in the queue. The scheme organizer profits because the income from joiners far exceeds the cost of sending out the item to the person at the front. Organizers can further profit by starting a scheme with a queue with shill names that must be cleared out before genuine people get to the front. The scheme collapses when no more people are willing to join the queue. Schemes may not reveal, or may attempt to exaggerate, a prospective joiner's queue position, a condition that essentially means the scheme is a lottery. Some countries have ruled that matrix schemes are illegal on that basis. While often confused for each other, pyramid schemes and Ponzi schemes are different from each other. They are related in the sense that both pyramid and Ponzi schemes are forms of financial fraud. However, pyramid schemes are based on network marketing, where each part of the pyramid takes a piece of the pie / benefits, forwarding the money to the top of the pyramid. They fail simply because there are not sufficient people. Ponzi schemes, on the other hand, are based on the principle of "Robbing Peter to pay Paul"—early investors are paid their returns through the proceeds of investments by later investors. In other words, one central person (or entity) in the middle taking money from one person, keeping part of it and giving the rest to others who had invested in the scheme earlier. Thus, a scheme such as the Anubhav teak plantation scheme (teak plantation scam of 1998) in India can be called a Ponzi scheme. Some Ponzi schemes can depend on multi-level marketing for popularizing them, thus forming a combination of the two. The side-by- side difference between a Pyramid Scheme and a Multi-level-marketing company. multi-level marketing (MLM) companies operate as pyramid schemes and consumers often confuse legitimate multi-level marketing with pyramid schemes. "have a real product to sell." "Not all multi-level marketing plans are legitimate. If the money you make is based on your sales to the public, it may be a legitimate multilevel marketing plan. If the money you make is based on the number of people you recruit and your sales to them, it’s probably not. It could be a pyramid scheme." Pyramid schemes however "may purport to sell a product, but they often simply use the product to hide their pyramid structure". While some people call MLMs in general "pyramid selling", others use the term to denote an illegal pyramid scheme masquerading as an MLM. Find—and study—the company's track record. Talk to other distributors. Beware of shills. Consider using a friend or adviser as a neutral sounding board, or for a gut check. Think about whether this plan suits your talents and goals. 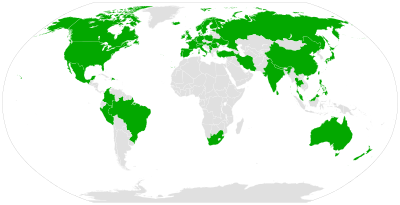 This map shows countries (in green) where pyramid schemes are known to be illegal. Pyramid schemes are illegal in many countries or regions including Albania, Australia, Austria, Belgium, Bahrain, Brazil, Canada , China, Colombia, Denmark, the Dominican Republic, Estonia, Finland, France, Germany, Hong Kong, Hungary, Iceland, India, Iran, the Republic of Ireland, Italy, Japan, Malaysia, Maldives, Mexico, Nepal, the Netherlands, New Zealand, Norway, Peru, Philippines, Poland, Portugal, Romania, Russian Federation, Serbia, South Africa,, Singapore, Spain, Sri Lanka, Sweden, Switzerland, Taiwan, Thailand, Turkey, Ukraine, the United Kingdom, and the United States. Pyramid schemes—also referred to as franchise fraud or chain referral schemes—are marketing and investment frauds in which an individual is offered a distributorship or franchise to market a particular product. The real profit is earned, not by the sale of the product, but by the sale of new distributorships. Emphasis on selling franchises rather than the product eventually leads to a point where the supply of potential investors is exhausted and the pyramid collapses. The 1997 rebellion in Albania was partially motivated by the collapse of Ponzi schemes; however, they were widely referred to as pyramid schemes due to their prevalence in Albanian society. In 2003, the United States Federal Trade Commission (FTC) disclosed what it called an Internet-based "pyramid scam." Its complaint states that customers would pay a registration fee to join a program that called itself an "internet mall" and purchase a package of goods and services such as internet mail, and that the company offered "significant commissions" to consumers who purchased and resold the package. The FTC alleged that the company's program was instead and in reality a pyramid scheme that did not disclose that most consumers' money would be kept, and that it gave affiliates material that allowed them to scam others. WinCapita was a scheme run by Finnish criminals that involved about €100 million. The scheme started in 2005. In early 2006, Ireland was hit by a wave of schemes with major activity in Cork and Galway. Participants were asked to contribute €20,000 each to a "Liberty" scheme which followed the classic eight-ball model. Payments were made in Munich, Germany to skirt Irish tax laws concerning gifts. Spin-off schemes called "Speedball" and "People in Profit" prompted a number of violent incidents and calls were made by politicians to tighten existing legislation. Ireland has launched a website to better educate consumers to pyramid schemes and other scams. On 12 November 2008, riots broke out in the municipalities of Pasto, Tumaco, Popayan and Santander de Quilichao, Colombia after the collapse of several pyramid schemes. Thousands of victims had invested their money in pyramids that promised them extraordinary interest rates. The lack of regulation laws allowed those pyramids to grow excessively during several years. Finally, after the riots, the Colombian government was forced to declare the country in a state of economic emergency to seize and stop those schemes. Several of the pyramid's managers were arrested, and are being prosecuted for the crime of "illegal massive money reception." In the United Kingdom in 2008 and 2009, a £21 million pyramid scheme named 'Give and Take' involved at least 10,000 victims in the south-west of England and South Wales. Leaders of the scheme were prosecuted and served time in jail before being ordered to pay £500,000 in compensation and costs in 2015. The cost of bringing the prosecution was in excess of £1.4 million. Throughout 2010 and 2011 a number of authorities around the world including the Australian Competition and Consumer Commission, the Bank of Namibia and the Central Bank of Lesotho have declared TVI Express to be a pyramid scheme. TVI Express, operated by Tarun Trikha from India has apparently recruited hundreds of thousands of "investors", very few of whom, it is reported, have recouped any of their investment. In 2013, Tarun Trikha was arrested at the IGI Airport in New Delhi. BurnLounge, Inc. was a multi-level marketing online music store founded in 2004 and based in New York City. By 2006 the company reported 30,000 members using the site to sell music through its network. In 2007 the company was sued by the Federal Trade Commission for being an illegal pyramid scheme. The company lost the suit in 2012, and lost appeal in June 2014. In June 2015, the FTC began returning $1.9 million to people who had lost money in the scheme. In August 2015, the FTC filed a lawsuit against Vemma Nutrition Company, an Arizona-based dietary supplement MLM accused of operating an illegal pyramid scheme. In December 2016, Vemma agreed to a $238 million settlement with the FTC, which banned the company from "pyramid scheme practices" including recruitment-focused business ventures, deceptive income claims, and unsubstantiated health claims. In March 2017, Ufun Store registered as an online business for its members as a direct-sales company was declared operating a pyramid scheme in Thailand. The Criminal Court handed down prison terms totaling 12,265 to 12,267 years to 22 people convicted over the scheme, which conned about 120,000 people out of more than 20 billion baht. ^ a b Smith, Rodney K. (1984). Multilevel Marketing. Baker Publishing Group. p. 45. ISBN 0-8010-8243-9. ^ "Pyramid Schemes". Federal Bureau of Investigation. Retrieved 2019-04-18. ^ Tracy McVeigh (2001-08-05). "Pyramid selling scam that preys on women to be banned". Guardian. Retrieved 2013-04-02. ^ Zuckoff, Mitchell (10 January 2006). Ponzi's scheme - the true story of a financial legend. New York: Random House Trade Paperbacks. ISBN 0812968360. ^ Ward, Susan. "Learn to Distinguish Between Multilevel Marketing (MLM) and Pyramid Schemes". The Balance Small Business. Retrieved 2019-03-29. ^ Keep, William W; Vander Nat, Peter J. (2014). "Multilevel marketing and pyramid schemes in the United States: An historical analysis" (PDF). Journal of Historical Research in Marketing. 6 (2): 188–210. doi:10.1108/JHRM-01-2014-0002. Retrieved 26 March 2016. ^ a b c Valentine, Debra (May 13, 1998). "Pyramid Schemes". Federal Trade Commission. Retrieved 25 March 2016. ^ Edwards, Paul (1997). Franchising & licensing: two powerful ways to grow your business in any economy. Tarcher. p. 356. ISBN 0-87477-898-0. ^ "Pyramid Schemes". 18 July 2013. ^ "Multilevel Marketing". 14 July 2016. ^ Clegg, Brian (2000). The invisible customer: strategies for successive customer service down the wire. Kogan Page. p. 112. ISBN 0-7494-3144-X. ^ Higgs, Philip; Smith, Jane (2007). Rethinking Our World. Juta Academic. p. 30. ISBN 0-7021-7255-3. ^ Kitching, Trevor (2001). Purchasing scams and how to avoid them. Gower Publishing Company. p. 4. ISBN 0-566-08281-0. ^ Mendelsohn, Martin (2004). The guide to franchising. Cengage Learning Business Press. p. 36. ISBN 1-84480-162-4. ^ Blythe, Jim (2004). Sales & Key Account Management. Cengage Learning Business Press. p. 278. ISBN 1-84480-023-7. ^ a b "Multilevel Marketing". Federal Trade Commission. Retrieved 20 June 2018. There are multi-level marketing plans – and then there are pyramid schemes. Before signing on the dotted line, study the company’s track record, ask lots of questions, and seek out independent opinions about the business. ^ Carroll, Robert Todd (2003). The Skeptic's Dictionary: A Collection of Strange Beliefs, Amusing Deceptions, and Dangerous Delusions. Wiley. p. 235. ISBN 0-471-27242-6. ^ Coenen, Tracy (2009). Expert Fraud Investigation: A Step-by-Step Guide. Wiley. p. 168. ISBN 0-470-38796-3. ^ Seth, Shobhit. "What is a Pyramid Scheme?". Investopedia. Retrieved 2019-03-29. ^ Commission, Australian Competition and Consumer (2015-05-14). "Pyramid schemes". Australian Competition and Consumer Commission. Retrieved 2019-03-29. ^ "Pyramid Schemes". Findlaw. Retrieved 2019-03-29. ^ "Pyramid schemes". Australian Competition and Consumer Commission. Retrieved 2012-04-08. ^ "Competition and Consumer Act 2010 - Schedule 2, Division 3 - Pyramid schemes". Austlii.edu.au. Retrieved 2013-04-02. ^ "Regulation on Prohibition of Pyramid Selling". www.fdi.gov.cn. Retrieved 2019-01-23. ^ "Colombia scam: 'I lost my money'". BBC News. November 18, 2008. Retrieved April 12, 2010. ^ "Proyecto De Ley Que Prohíbe La Venta Bajo El Esquema Piramidal" (PDF) (in Spanish). ^ "Tarbijakaitseseadus" [The Consumer Protection Law of Estonia] (in Estonian). §12³(8) #14. Retrieved October 11, 2010. ^ "Rahankeräyslaki 255/2006 - Ajantasainen lainsäädäntö - FINLEX ®". ^ "Pyramid Schemes Prohibition Ordinance". Retrieved 23 January 2019. ^ "Key GoldQuest members arrested in Iran Airport". Presstv.ir. Retrieved 2013-04-02. ^ "Pyramid Schemes". Competition and Consumer Protection Commission. Retrieved 12 June 2015. ^ "Sentence by the High Council of the Netherlands regarding a pyramid scheme". Zoeken.rechtspraak.nl. Retrieved 2013-04-02. ^ "Lovdata.no". Lovdata.no. Retrieved 2013-04-02. ^ NYtimes.com, "Investors in Philippine Pyramid Scheme Lose over $2 Billion"
^ "Saadet zinciri operasyonu: 60 gözaltı". Cnnturk.com. 2010-05-14. Retrieved 2013-04-02. ^ "Pyramid scheme fraud". Action Fraud. City of London Police. Retrieved 5 July 2016. ^ "FBI — Common Fraud Schemes". Fbi.gov. Retrieved 2013-04-02. ^ "Finance and Development". Finance and Development | F&D. Retrieved 2018-07-04. ^ "SS: Some WinCapita Ponzi scheme victims to soon receive compensation". Yle Uutiset. Retrieved 2018-07-04. ^ "National Consumer Agency Ireland". Consumerconnect.ie. Retrieved 2013-04-02. ^ Colombians riot over pyramid scam. Colombia: BBC news. Nov 13, 2008. ^ "Caught! American arrested in Kyiv on suspicion of fraud - Nov. 26, 2008". KyivPost. 2008-11-26. Retrieved 2018-07-04. ^ "Prosecuting members of a £21m pyramid scheme cost taxpayers £1.4m". 14 September 2015 – via www.bbc.co.uk. ^ "Trikha family to be investigated in online TVI Express scam". MailOnline India. 2013-04-20. Retrieved 2013-07-24. ^ Hull, Tim (2 June 2014). "9th Circuit Affirms BurnLounge Judgment". Courthouse News. Retrieved 19 June 2014. ^ "Vemma Agrees to Ban on Pyramid Scheme Practices to Settle FTC Charges". FTC.gov. Retrieved 22 December 2016. ^ "Vemma reaches $238 million settlement with FTC". TruthInAdvertising.org. Retrieved 22 December 2016. The Fraudsters: How Con Artists Steal Your Money, Chapter 9, "Pyramids of Sand" (ISBN 978-1-903582-82-4) by Eamon Dillon, published September 2008 by Merlin Publishing, Ireland. This page was last edited on 18 April 2019, at 00:31 (UTC).